Another mobile installment in the life simulation game series by Electronic Arts. As per tradition, The Sims Mobile focuses on simulating and shaping the lives of your virtual characters. You can choose their appearance, personality, and life goals, from career paths to hobbies. 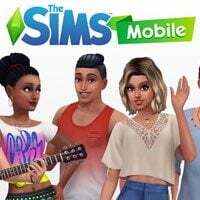 The Sims Mobile for AND and iOS is a life simulation game by Electronic Arts. The production utilizes a free-to-play model with microtransactions. Traditionally, The Sims series focuses on simulating the life of virtual characters, and it’s no different here. You have much freedom when it comes to character creation. You can decide on their appearance, choosing from a variety of skin tones, hairstyles, clothes, and accessories. You also pick your Sim's personality and life goals, from their career path to their hobby. All of that affects their life goals, which you then try to achieve. The Sims' living quarters can me modified with various pieces of furniture, devices, and decorations. As the game progresses, you unlock new activities and locations. You can also throw parties or be invited to them by other Sims. During those gatherings, you gain friends and develop romantic relationships. You also participate in special events, such as speed-dating in the park. The Sims Mobile for AND and iOS also allows you to shape the histories of whole families. When a character achieves their goals and retires, you gain special keepsakes, thanks to which you can unlock new interests and careers for next generations. For example, what the grandfather achieved as a lawyer may inspire his granddaughter to become a judge, and having an uncle who was a cook can inspire his nephew to be a star of a culinary TV show. The game features attractive 3D visuals with a slight cartoonish edge.